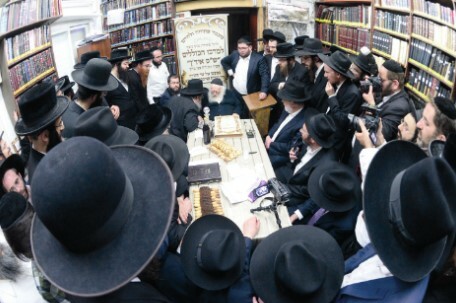 For a second time this year, the Sar Hatorah opened his home to the Shas Yiden. For the last few years, Maran Hagaon Harav Chaim Kanievsky has farhered all twenty-one gaonim avrechim with questions on the entire Shas, satisfied himself as to their incredible erudition, and then celebrated their annual Siyum Hashas with them. Sar Hatorah Rav Kanievsky had requested the Nasi, Hagaon Harav Avrohom Eisen, Pozna Rov, shlit”a, to consider opening a Bnei Brak branch kollel of the Bet Shemesh-based Shas Yiden. Just over a week ago, on Rosh Chodesh Iyar, led by the Rosh Kollel, Hagaon Harav Isaac Samet, shlit”a, a minyan of gaonim avreichim became part of this incredible Torah project. 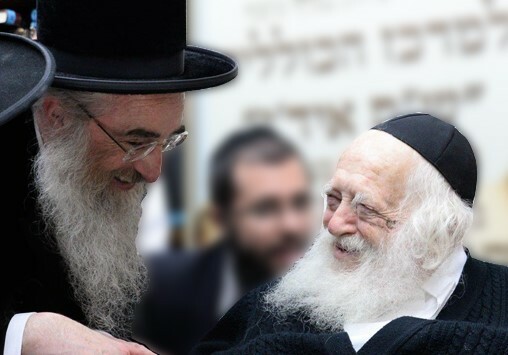 As news spread about Shas Yiden opening in Bnei Brak, other outstanding avreichim have approached Rav Eisen, urging him to open branches in other locations of leading Torah communities. Shas Yiden has developed a sophisticated and carefully assessed method and technique to enable talmidei chachomim to complete Shas on an annual basis, and to master it b’al peh (by heart). In only one week the new avreichim have all completed fifty-six daf plus four chazoras on each – a total of 280 daf! Like the rest of the Shas Yiden, they will be required to sit for written detailed exams on 225 daf every month. The rest of the Shas Yiden avreichim just completed their half year exam on 1600 daf! With the new kollel, the chabura of Shas Yiden has now grown to 31 gaonim talmidei chachomim who are enhancing the Torah landscape of Eretz Yisroel and abroad. The official launch of the new kollel was a singular experience – an intimate gathering of Torah lishmah. The avreichim from Bet Shemesh were present with the new avreichim, and all squeezed into the room. The atmosphere was electric, especially that the Sar Hatorah was present. Beaming, Rav Chaim began the evening throwing out some complex questions from Shas to the avreichim. The ‘thrust and parry’ of the discussion was something to behold. Earlier in the day, there was an informal farher on Shas and the erudition of the avreichim was simply amazing. Some supporters of Shas Yiden and members of Rav Eisen’s Pozna kehillah in Flatbush flew to Eretz Yisroel to be part of the simcha. All bnei Torah, they were overwhelmed by the mastery of Torah that they witnessed. The Shas Yiden are scholars who know Shas from ‘cover to cover’. 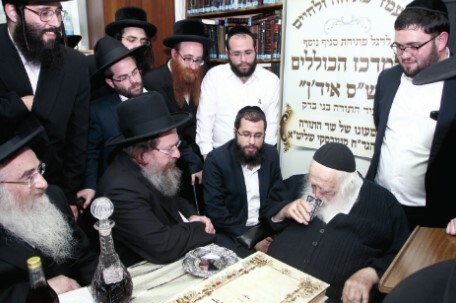 At Rav Chaim they all partook in the ‘lekach un brondfin’ of the Sar Hatorah. Each was introduced to Rav Chaim and were given brochos that they will never forget. They were all enthralled by the experience and joy of this special event. Among the new avreichim is a grandson of Maran Hagaon Harav Gershon Edelstein, shlit”a, Rosh Yeshiva at Ponevez. All of the avreichim had to pass searching tests on 450 blatt to be accepted into the program. Aside from the daily study load, the sense of commitment of the avreichim is quite unique. If one misses out one day, that means need to do 16 daf the next day plus four chazoras, equals 80 daf! Moreover, it is not just a commitment from them, it is an incredible commitment by their wives and families. At every siyum, a special acknowledgement and presentations are made to the wives in recognition of their mesirus nefesh. Unbelievable – 160 Days More Per Year at Shas Yiden! Shas Yiden officially learns almost double the days that is customary in regular kollelim around the world! Generally, kollelim have official bein hazmanim during the months of Tishrei and Nisan (60 days), Av (20 days), plus Fridays and Shabbos every week and the Yom Tovim – that means a minimum of 160 days off official learning per year! Being an avreich at Shas Yiden means giving one’s all for the learning of Torah. Literally, every minute of every day is devoted to Torah. 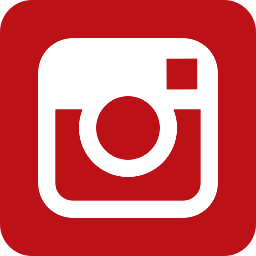 There are no bein hazmanim – period. It is no wonder that the Shas Yiden project has the full support of the gedolei Torah, Roshei Yeshivos and Dayonim across Eretz Yisroel and beyond. Each of these remarkable gaonim bnei Torah will be counted among the gedolei Torah of tomorrow. The late Maran Hagaon Harav Yaakov Edelstein, zt”l, was also an avid supporter of Shas Yiden and was a great source of encouragement to Rav Eisen for many years. In fact, the last letter he wrote before his passing was regarding the opening of the new Shas Yiden kollel branch in Bnei Brak. ‘Reb’ Yaakov referred to the avreichim as “Those who learn the whole of Shas with great clarity” and added that those who support Shas Yiden will be blessed many times over. His words were endorsed and the letter co-signed by Harav Chaim Kanievsky, Harav Gershon Edelstein, and Harav Berel Povarsky. Yissachar-Zevulun pacts at Shas Yiden enables a person to acquire the zechus of the entire Shas in just one year. Yoreh De’ah #246 states in this regard that for the Zevulun (the sponsor) it is considered as if he learned it all himself. This whole Shas opportunity has become a source of comfort for people to sponsor such a zechus for their dear ones during the year of mourning – and to have a siyum of the entire Shas on the first yahrzeit!